A proud people who take their cultural obligations seriously, Aboriginal people bear these scars with regret and remorse, unlike their forefathers whose initiation scars were worn with pride (like the ‘bolitj’ or the adornment scar). Under the care of the cardiac surgeons whose scalpels have replaced the traditional stone knives, chests are cut to reveal heart valves crippled by rheumatic heart disease (RHD) caused by repeated attacks of acute rheumatic fever (ARF). childhood, as they are forced to have painful monthly injections, missing out on many school days and play. There is no vaccine, RHD is not recognised as a childhood disease like measles or mumps, it must be stopped now. We need to put this disease in the history books for our children and grandchildren. RHD is both a condition of the heart valves and of social injustice. RHD is caused by repeated episodes of group A streptococcal (Strep A) infection of the pharynx or skin. In some people, Strep A infection precipitates an abnormal autoimmune reaction, acute rheumatic fever. endocarditis and maternal morbidity during pregnancy. However, the broader causes of RHD are rooted in the social determinants of health- poverty, overcrowding and limited access to health services. Aboriginal communities in the Northern Territory now have the highest rates of ARF in the world. In Australia, ARF and RHD are overwhelmingly a disease suffered by Aboriginal and Torres Strait Islander peoples. Young Aboriginal people in the Northern Territory are 122 times more likely to have RHD than other young people, and in the Kimberly our mob are dying midway through life at age 41 (nearly 4 decades lower life expectancy than the Australian average). Over the years, the Federal Government has demonstrated a commitment to the elimination of RHD in Australia with investment in programs such as the Rheumatic Fever Strategy. In 2009, as part of the Rheumatic Fever Strategy, Rheumatic Heart Disease of Australia (RHDA) was established with the mandate to reduce death and disability from ARF and RHD in Aboriginal and Torres Strait Islander communities. Provided education to State and Territory-based RHD Control Programs. RHDA’s new mission is to work alongside Aboriginal and Torres Strait Islander peoples, and other at-risk populations, to reduce acute rheumatic fever and rheumatic heart disease across Australia. RHDA does this by developing resources to support health systems and health staff in their work, and by advocating and providing culturally appropriate educational resources for people with ARF or RHD and their families. RHDA has established a Champions4Change program, bringing together a group of people from across Australia with lived experience, carers and those working with people and communities suffering from ARF and RHD. Champions are encouraged to use their cultural knowledge and shared understanding of health beliefs to create change, inspire others by sharing their stories and experience. This is not new for Aboriginal people who have nurtured and protected their communities for thousands of years. Mothers and grandmothers, as they always have, take a shared responsibility to look after all children in the community. Our Elders have always helped children grow into adults often in sacred ceremony, guiding children to navigate the complexities of traditional social structures. Embedding culture into everything we do at RHDA is now commonplace. We are continually changing the lens with which we see and do things. We are committed to finding innovative and creative ways that embraces Aboriginal and Torres Strait Islander peoples’ ways of thinking and doing. We believe that change needs to happen both ways from community and within, there needs to be Aboriginal leadership and true partnerships with local communities. We need to empower our young while drawing on our Elders’ wisdom and resilience. RHD is preventable and relatively unknown throughout Australia we need your support to put this disease in the history books. RHDA is part of a coalition to end this disease. Please take action now and sign the pledge and join the movement to end RHD. For more information on ARF and RHD visit the RHDA website. Ms Wade is a proud Noongar woman and has lived and worked in NSW on the lands of the Cabrigol people of the Darug Nation for over fifty years. 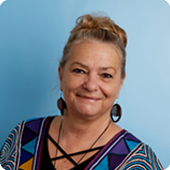 She has dedicated over 40 years to improving the health of all Australians and for over twenty-five years she has dedicated her efforts to closing the health gap of Aboriginal and Torres Strait Islander peoples. She is a respected leader and advocate in Aboriginal health. Ms Wade has taught undergraduates and postgraduates Aboriginal health and cardiac health, been an ICU/CCU nurse educator, Cardiac Rehabilitation nurse, Clinical Nurse Consultant Cardiology, Area Director for Aboriginal Health, NSW State Manager of Aboriginal Vascular Health, Cultural Advisor to the National Heart Foundation of Australia and current Senior Cultural leader of RHD Australia. As a life-long member of the CTG steering committee and a strong advocate for her people Vicki hopes her efforts make a difference for her grandchildren.